Gourmet coffee, tea and organic cocoa are even better when given as gifts. We have put together a huge selection of coffee gifts and coffee gift baskets along with tea and organic cocoa gifts for every budget and taste preference. 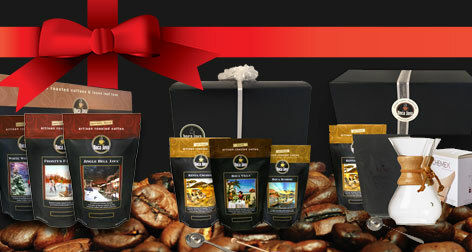 Our coffee gift boxes come ready to give, so all you have to do is place an order. Our coffee gift sets come with everything needed to make the perfect cup. Buy a Coffee of the Month gift and we will fresh roast and deliver two bags of gourmet coffee every month. No matter the occasion, one of our gourmet gifts will be the gift they remember.